The biggest sports event of the year is finally here—the Super Bowl. Some may be excited for the final match up and others may be disappointed they’re hanging up their favorite team jersey, but no one can deny the excitement that surrounds this big event. With a big event like this, comes bigger parties. And with big parties comes tasty treats. What better treat is there than Mochi Ice Cream? Some of the best aspects of any sports party are the decorations—balloons, plates, tablecloths, streamers, etc. Right away you can tell if you’re in a house that is rooting for a particular team or if they’re just happy to have people over! The best part about Mochi Ice Cream is that you’ll be able to choose not only your favorite flavor, but you can choose Mochi by the colors. So for this year’s Super Bowl party, you could take our vibrant Mango Mochi Ice Cream that would go perfect for any Denver Broncos fan. On the other hand you have to satisfy the Carolina Panther fans, so you can set out our classic Vanilla Mochi Ice Cream. Ask any Super Bowl party goer what one of their favorite thing is, and they’ll probably tell you it’s the finger foods. Wings, pigs in a blanket, chips and dip, chicken tenders, to name just a few. If you’re a good host you know your guests will be craving something sweet by halftime. The great thing with Mochi Ice Cream is that it’s completely bite size and perfect for all guests. No scooping, no cutting, or really even plating! Take them out of the box and boom—a perfect and tasty snack for all. 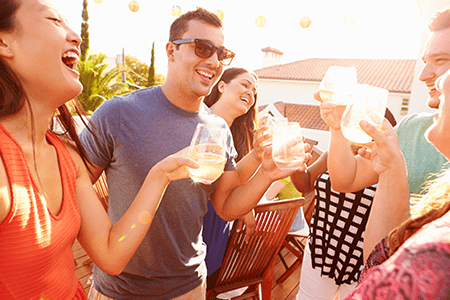 When hosting a party it’s important to think of everyone who may be coming to your party. Sure, maybe everyone loves Mochi Ice Cream, but not everyone may love strawberry or green tea flavors. You wouldn’t have just one thing to eat for everyone, right? Don’t hold back with your sweet treat either. If you don’t want to go the color route, try a variety of flavors like Chocolate, Green Tea, Mango and Black Sesame. Typically when you’re throwing a Super Bowl party, there may be people your guests haven’t met before. Instead of having people separated into familiar groups, you want them to mingle and meet new people as well. Just like the water cooler is a social hub for people at work, food will do the same thing for guests at your party. It allows them to start talking and get to know each other. The fun texture and feeling of Mochi Ice Cream will certainly give people something to bond over. Whether you’re a diehard fan of either team, or have no idea what football is and just enjoy the commercials, there’s something about Super Bowl parties that bring people together. If you’re hosting your own party this year, remember the ways you can make it a great hit with Mochi Ice Cream.